Discovered in 1901, the Antikythera Mechanism has long been called one of the earliest computers. For years scientists had no idea what it did, ascribing it with almost mystical functionality. Through the use of advanced imaging techniques, we now know that this lump of crusty, corroded brass was actually an astronomical computer that allowed ancient Greeks to predict the passage of the planets. The various known indications of the Antikythera “machine” have been faithfully reproduced on its modern-day counterpart, both on the front and on the back. The primary face of the movement shows: the calendar for the Panhellenic games (which designated those cities hosting the games), the Egyptian calendar (12 months each of 30 days, with the epagomenal, or additional, days), the position of the sun in the constellations of the Zodiac, the phases of the Moon (with a magnificent hand and aperture which shows the position of the Moon in the zodiac throughout the sidereal month), as well as the sidereal year. The back of the watchmaking movement shows the Callippic cycle, the Metonic cycle, the Saros cycle and the Exeligmos cycle. 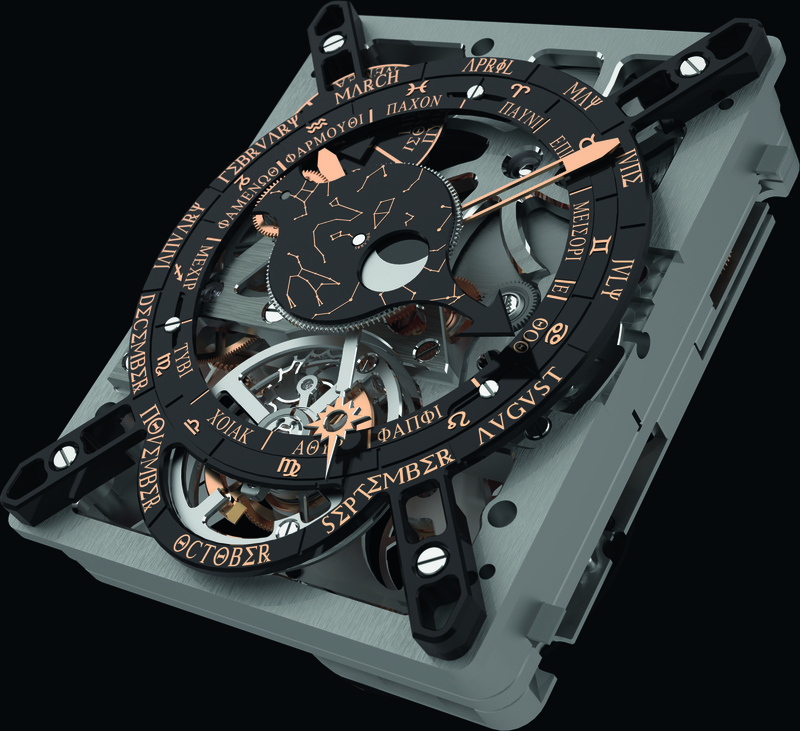 The watch will be on permanent exhibit at the Musée des Arts et Métiers in Paris after appearing at BaselWorld 2012. The watch uses the mainspring to power these Antikythera registers, adding life and vibrancy to what would have once been a hand-cranked navigational system. It all fits into a tiny package that can be worn on the wrist. Because this is a one-off piece, expect it to cost somewhere in the millions if it is ever sold.